Theoretical biology is still in its early stages as an academic discipline. There is even little agreement as to what topics it should deal with or in what manner it should precede; and it is only recently that philosophers felt called upon to notice the relevance of biological topics as evolution or perception to their traditional problems. This work is a publication of the International Union of Biological Sciences, the central organization of all the branches of biology. The main focus here is to explore the possibility of formulating some frame of concepts and methods around which theoretical biology can grow.The intention of this collective effort was that discussions would be concerned, not with the theory of particular biological processes, such as membrane permeability, genetics, and neural activity, but rather with an attempt to discover and formulate general concepts and logical relations characteristic of living as contrasted with inorganic systems. Further, this project is a consideration of implications these might have for general philosophy. 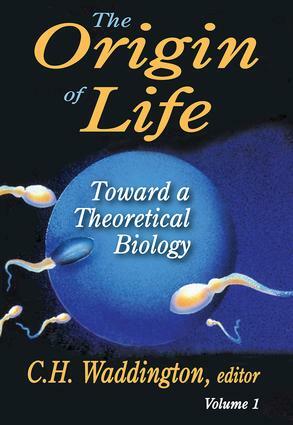 Many well-known scientists contributed to this volume, such as J. Maynard Smith, Ernst Mayr, Brian Goodwin, and Renu Thom.The Origin of Life: Toward a Theoretical Biology explores the character of the problems facing any theory of general biology. It contains a series of chapters and exchanges discussing such topics as the origin of life, cellular differentiation, morphogensis, evolution, and indeterminacy in biological and physical systems, the organization of the brain, the statistical mechanics of non-linear oscillators, and many other topics. This is a pioneering volume by recognized leaders in an emerging field�the first of four such works.